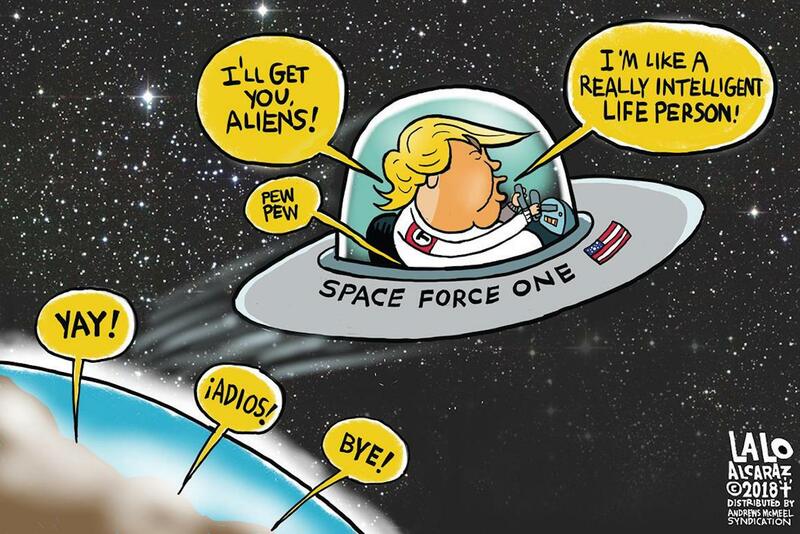 Here's a brief glimpse of Trump's dream about a new military space force for America. Commander Officer: "Mr. President, we're ready to attack the moon on your order." Trump: "Oh goody! Don't leave any survivors." Commanding Officer: "Excuse me sir, but as far as we know there's no life on the moon." Trump: "Fake News! We can't let those damn liberals dictate our national security policies!" 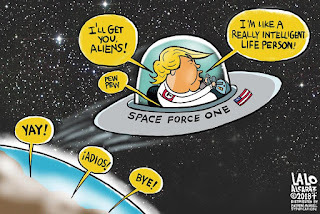 One of the many ridiculous things Trump has proposed, beside holding a parade designed to make the world's autocrats jealous, is a new branch of military service - a Space Force (Star Wars theme playing in background). The idea is going over like a lead balloon with the Pentagon. Trump's own general, Jim Mattis, has made it clear he thinks it would add burdensome bureaucracy and unwanted costs. Nevertheless, under Trump's orders, the Pentagon did a study expected to call for creating a new military command. The results will be released sometime next week. The bottom line is it takes congress to okay a new military unit. The chances that any legislative proposal to create this separate service this year, are slim to none. Realistically,if Trump isn't impeached before then, it's not on any one's priority list to do, except Donny's. Some may call Trump a dreamer... but most call him a demagogue!